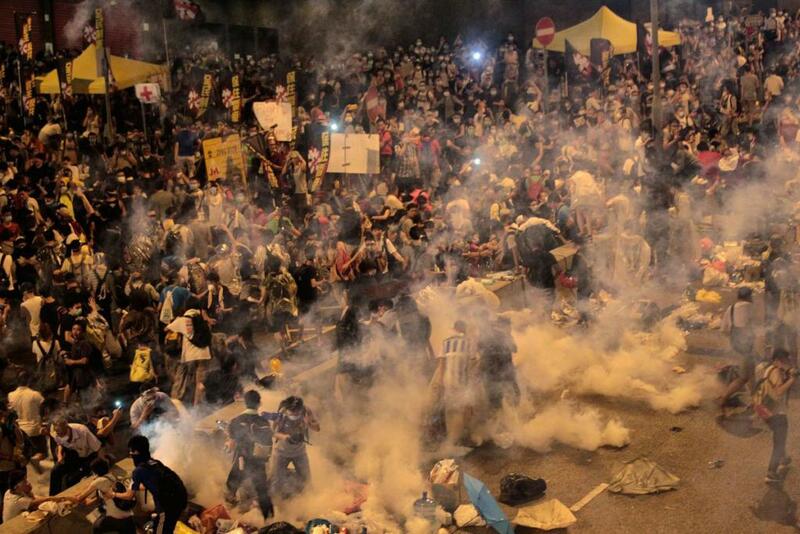 A short introduction to the ongoing protests and police attacks in Hong Kong. Hong Kong has been filled with clouds of tear gas and the sting of pepper spray as the government brutally throws its force again and again against the thousands of protesters occupying the streets. The tens of thousands of protesters are demanding basic democratic reforms from the central government in Beijing. The response they have received is volley after volley of tear gas launched at students and workers without any warning or provocation. There have been frequent charges by the police using batons and pepper spray to push protesters out of the public squares and streets of the city. The violence shown by the Hong Kong police is not unique to China. It is how all states behave when they are confronted with a direct challenge to their power. We have seen the same police attacks happen against the US Occupy camps, at the Gezi Park protests in Turkey, and in countless similar protests around the globe. Sine we are workers who have faced the same repression, or could very soon face the same repression, this is why it is important for us to condemn the attacks of the Chinese government and support the protesters in resisting them: because we are all in one battle together, and we are all facing the same enemy. And if we do not support those in the streets of Hong Kong, who will be there for us when we are occupying our own streets? The main demand of the protests in Hong Kong is for real universal suffrage. The central government has mandated that candidates for the leader of Hong Kong in the 2017 election will be chosen by a pro-Beijing nomination committee, rather than having an open vote. Despite the massive size of the protests and the blocking of many main streets, mostly in the areas of Admirty, Causeway Bay and Mongkok, most of the city is continuing as normal and it is unclear what economic impact the protests are having. Though this could change – today, which is China National Day, the protests have grown to a much larger size and spread to new locations. To make their power felt more acutely, the workers of Hong Kong will need to leave their workplaces and go out to blockade the streets. The Hong Kong Confederation of Trade Unions (HKCTU) – an independent union of the socialist labor party type with roots in the Christian labor movement – has called for just that: a political strike in support of the protests. This is an important moment for the movement. However, the HKCTU is small, so it will take many more non-union workers joining the strike to make a significant impact. Though many media reports identify Occupy Central With Love and Peace (usually identified as just Occupy Central in the media) as the main force within the protests, they are in fact the tail end of the protest movement. They had previously delayed the start of this occupation for months and used the threat of the occupation as a mere bargaining chip in their negotiations with the government. When the Hong Kong Federation of Students (HKFS) moved to begin the occupation themselves in July, they received no support from Occupy Central With Love and Peace. As a result 511 people were arrested when the police dispersed their camp. This time when HKFS called for a week of student strikes and protests, enough supporters came out to the streets that the Occupy Central With Love and Peace central committee was forced to call for an immediate occupation to avoid being left in the dust (even though many started leaving the protest at first when Occupy Central With Love and Peace joined, because they were afraid that they were co-opting it). Though the HFKS called for the actions that have now led to this massive mobilization, they too have found themselves lagging behind. After the first day of occupying central Hong Kong, the leaders of the HKFS asked the people to leave the streets for the night to avoid more police violence. Instead, the people choose to ignore the voices from the main stage and have continued occupying the district. So now there is no voice that is commanding the course of events, no committee that is deciding what will happen next – the people in the streets are making those choices themselves. What those choices will be no one can say. Hong Kong is in a situation of mass spontaneity. However, it is unlikely that this spontaneity will take the people of Hong Kong very far beyond the demands and consciousness of liberal bourgeois democracy. Right wing sentiment is strong within the protest movement, with many protesters seeking to defend what they see as their national homeland against the incursions of the mainland Chinese. This includes the right wing organization Civic Passion (熱血公民), which has been highly visible in the protests. Meanwhile, the left in Hong Kong is very small, weak and disorganized. While there are various left groups and anarchist collectives in the front lines of the protests, no segment of the anti-capitalist left is able to put into action a strong strategy for pushing the struggle beyond basic electoral demands (though not because of a lack of good effort). Protesters who prepare a defense against police attacks by building barricades out of rubbish bins are attacked by their fellow protesters for being the violent ones, destroying property and provoking the police. Like any liberal, these protesters are often quicker to denounce the simple self-defense of their comrades than they are to denounce the outrageously violent attacks of the police. But even with these limits, this is an important moment for the working class of Hong Kong to grow its consciousness and gain a sense of its own independent power. Though the right is very present in the protests, there is an opportunity for the left wing of the working class – fragmented, contradictory and unappealing as most of it is – to show leadership and to start building something grander and more long term than a few days of protest. So we must stand with those who struggle and support them as they occupy the streets of Hong Kong and resist the cruel and violent police attacks. Probably the best English article we've seen on this so far. We're working on our own piece to fill in some of the background - hopefully out in the next day. - According to the HKCTU, over 10,000 workers went on strike yesterday. That sounds amazing, but no one we've talked to is aware of such a thing. Several said they're like to see a general strike, but think it would be impossible. Some port workers said they'd like to organize a port shutdown, but they think that would be especially difficult, given the disheartening defeat of the big port strike effort a couple years ago. But we're not sure what HKCTU's claim signifies, especially since yesterday and today are national holidays, so most workers weren't supposed to go to work anyway. I assume HKCTU is just counting as "on strike" anyone who doesn't go to work and goes to the occupations? - You say that HK's tiny and fragmented radical left has not yet managed to "put into action a strong strategy for pushing the struggle beyond basic electoral demands (though not because of a lack of good effort)," but our impression is that there really hasn't been much effort beyond a few individual speeches and actions (mainly building the barricades in mk on the first day, and a thwarted attempt to occupy an abandoned bus). This lack of coordinated effort to push things forward by radical leftists and anarchos has led a few newbies with incoherent politics, who are becoming frustrated with the lack of action and direction, to become attracted to newly forming grouplets with a vaguely right-wing language, railing against the opportunism and anti-militancy of what they call "left pricks" (but apparently they're referring just to mainstream pan-democrats in general). - Today finally for the first time some "passionate citizens" felt bold enough to wear their affiliation shirts while taking the lead in defending the mk barricade against people (apparently local business owners) who were attempting to tear them down, in the face of police who had come to mitigate the dispute. this is a perfect example of the right rising to the opportunity created by the absence or inertia of the radical left. HK's only prominent marxist organization involved in this sort of thing is Left 21, and so far they have basically been adopting and promoting the liberal pro-democracy discourse uncritically, except for a few individual speeches by Left 21 members trying to link democracy to economic justice issues. The anarchists have, as usual been either focusing on technical support or hanging out on the sidelines complaining about how they feel marginalized, that it's not their movement. - One reason for this situation is that, after the initial police attack in September 28, there haven't been any more police attacks or efforts to clear the occupations. (This a little unclear from your article. It gives the sense that there have been conflicts w/ the cops every day.) If there were more conflicts with the police, that would be an opportunity for the radical left to take an active role to stimulate antagonism and attract nascent radicals from the broader participants (some of whom are now being attracted to the vaguely right-wing circles and literature). Several student participants said the government has switched its tactic from attack to waiting for the movement to lose steam, develop conflicts with the broader hk population, and die on its own. Those students wanted to revive the energy of September 28 and 29, but felt constrained by the leadership of the two student federations. So this is where both those discontent students themselves and radical leftists and anarchist should start playing a role, but so far they don't seem to have made much effort in that direction. Hopefully that will change in the next day or so; otherwise, either the movement will dissolve on its own, or the police (or even army, as some fear) will attack and no one will be prepared to defend themselves, except perhaps the (fortunately also tiny) right-wing fringe. Anyway, thanks for writing this. Thanks for the response, Nao. It's very helpful. And thanks for the compliment! I agree with all of your critiques of the article, and apologize if I misrepresented things at all. Don't think you misrepresented anything. Thanks for writing the article. We may post some updates as they occur.